Tyresavers (UK) Ltd are a proud supplier of Continental tyres, one of the largest and most respected brands of performance tyres for cars, 4X4s and vans. Continental combine decades of experience with dedicated research and product development to produce a range of tyres that offer outstanding performance in wet or icy conditions, placing emphasis on the importance of safety in driving. Continental also focus on increasing mileage and fuel economy, ensuring the best performance out of every car. Tyresavers (UK) Ltd operate from our base in Ongar to all of Essex, offering a first class service and fantastic prices. Our team of fitters are friendly and professional, offering expert fittings and a quick service. Our daily deliveries of new stock ensure that we always have a wide variety of tyres for our customers to choose from. 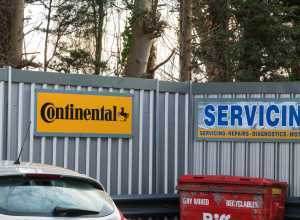 For more information on the range of Continental tyres we carry, or for an enquiry about any of our other products or services, contact us here and we’ll be happy to help.